Make these Asian-inspired shrimp fritters to help spice up your weeknight cooking. 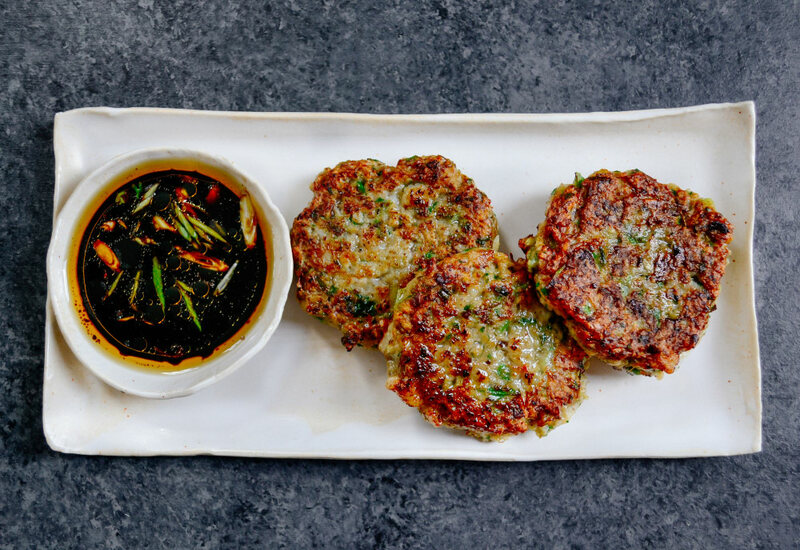 The flavorful fritters are made with shrimp, water chestnuts, mushrooms, scallions, ginger, garlic and cilantro. Then a simple sauce made with soy sauce, toasted sesame oil and scallions is perfect for dipping! This is a quick and easy starter, or it can be bulked up with a crunchy slaw or avocado salad and transformed into a unique main dish. Cutting back on your sodium intake? Feel free to swap low-sodium soy sauce for the regular soy sauce. If you are following a gluten-free diet, look for Tamari in the grocery store. It is gluten-free soy sauce! Per Serving: 144 calories; 8g fat; 6.6g carbohydrates; 12g protein; 96mg cholesterol; 818mg sodium. These were crispy and delicious. I made a double batch and served them at my house party. The ginger, garlic, and cilantro flavors were incredible together. I will probably make these again at my next get together. These were very good shrimp fritters! Love the use of grapeseed oil for frying. Nice switch from vegetable oil. Perfect for dipping in soy sauce. Reminds me of an appetizer I wonder order at a restaurant! These were really good. I used tamari instead of soy sauce, just a presence of flavor. Can’t wait to make these again, they’re perfect with fried rice.